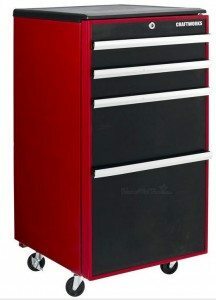 Whirlpools Gladiator Garageworks Freezerator convertible garage refrigerator was a great concept but was discontinued a few years ago. Like it’s cousin the Chillerator, this fridge was designed specifically for the garage. A Built-In Heater kept your items at the optimum temperature, even during extremely cold periods. What was unique about the Freezerator was it’s configurability. 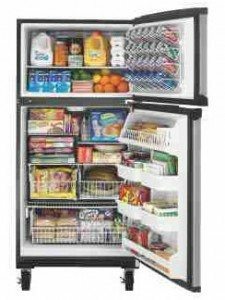 The entire unit could be used as an upright freezer, or the top portion can be used as a refrigerator. Now that’s cool and would be expecially useful after a big hunting trip for storing all that meat. The Freezerator sported 21 cubic feet of total storage to stuff full of frozen goods and still have room for a few cold ones above. It rolled on massive 5″ castors making it easy to clean underneath and move it around the garage. Last winter I discovered a mouse made a nest under my old trusty garage refrigerator and chewed up the wires. With the Freezerator, that won’t happen again. Another handy feature of large casters on your garage fridge is when you move, simply unlock the castor and move the complete Freezerator with contents up into the moving van. No unpacking for short trips! The lower compartment features adjustable shelves and pull out baskets. The upper compartment has a cool Door Mounted Beverage Rackthat holds 24-12 oz. cans or 20 oz. bottles. I can’t wait until beer is packaged in 20 oz. containers! Built garage tough, the Freezerator will keep your items Chilled Inside when it is Hot Outside (up to 110°F). The built-in heater maintains the proper temperature when it is Freezing Outside so your items don’t freeze too (down to 0°F). This unit was priced less than $1,000 and I am hoping it will return to the market in 2014. Sign-up to our newsletter for product updates to be informed as soon as these are available again. It unfortunate but the Gladiator Modular Garage Refrigerator was DISCONTINUED less than a year in production. I’m not sure why, as this was the perfect companion which fit like a glove under the Gladiator workbench and matched all the other cabinets and appliances. 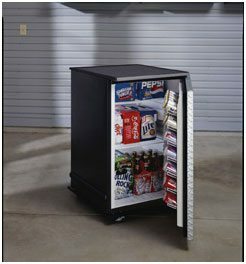 This Modular Garage Refrigerator helds 35 cans or frothy beverage in the door. With six cubic feet of storage and adjustable shelves, the modular fridge may be the perfect size for your garage (26”w x 24”d x 35” h). That’s enough room for 170 twelve-ounce cans (over 14 twelve packs of cans!). Designed to fit nicely under the Gladiator™ workbench, the locking caster and optional ½” maple wood top provide additional garage work surface when needed. The Modular Garage Refrigerator also incorporated the heater to keep items from freezing. I may be one of the few proud owners of this rare refrigerator. This was the sharpest tool in the garage. 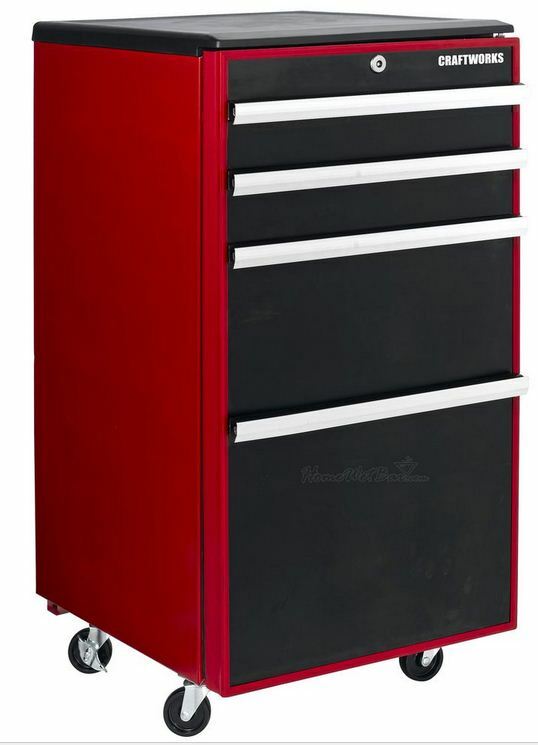 Designed to look like a rolling tool chest, the Craftsworks toolbox refrigerator was very popular and priced right. It was even featured on Good Morning America. A nice feature was the locking door where you could secure your contents from garage intruders. Features include an easy-clean counter top surface, heavy-duty lockable rolling casters, a black interior with interior lighting, space saving can stacker, spill resistant shelving, auto-defrost, is Energy Star Certified so it uses about 1/2 the energy of an older refrigerator, and comes with enough space to hold dozens of beverages and plenty of food to keep you from having to go inside to “refuel” while working outside. 4.4 cubic feet, measures: 37″ tall x 18.63″ wide x 22.63″ deep. I wish someone would start manufacturing a cool fridge like this again.